The selection of Kitchen floor covering for our period homes is always a challenge-we want style and durability, as well as a floor that fits in with the architecture and period of our house. Many of our homes have the original wood floor-either Douglas fir or oak strip. If the wood is in good condition it can be repaired and refinished. If you have an active household and worry about the upkeep of wood, linoleum is a good alternative for you. I am speaking of genuine linoleum, not vinyl flooring. Linoleum has been in use for over 100 years. It was originally patented in 1860. It is made from linseed oil, rosins (from pine trees) and wood flour, all of which are readily renewable natural resources, which are calendered onto a natural jute backing. Linoleum fell out of favor with the invention of vinyl flooring and no wax coatings for vinyl. 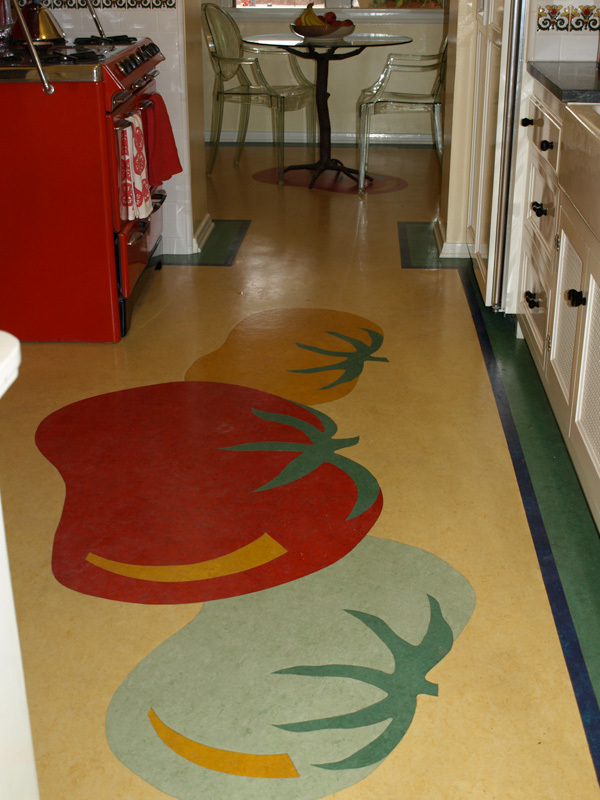 Linoleum has gained popularity in the past 20+ years when the “green” building movement began. In recent years the product has been improved with the development of factory applied finishes, which eliminate the need for a surface finish application at the time of installation. It has inherently bactericidal properties, is anti-static and very resistant to many solvents and acids, including acetone, alcohol, paint thinner and citric acid. It’s easy to maintain, is repairable, is warm and comfortable to the touch as well as inherently resistant to fire. In addition to all of these excellent qualities, linoleum is available in a wide range of colors and patterns and the design possibilities are endless. The material can be hand cut on the job by installers for borders and simple patterns or water jet cut for more intricate patterns. Seam weld rod can be used in matching or contrasting colors to add to the design. Any motif is possible. You can match a pattern in a tile or fabric or create a custom border pattern. The subtle marbling pattern of the material itself adds to the design and is a great camouflage for dust and dirt between cleanings. Maintenance involves sweeping on a regular basis to prevent damage from soil and grit and damp mopping with the recommended cleaner. Most manufacturers have a floor finish available for use in high traffic areas once the factory applied finish shows some wear (usually after 5-7 years) or if you prefer a high gloss finish. These products are “green” as well. So if you are considering a new Kitchen floor, take a look at “old school” linoleum. You may be pleasantly surprised.